Leave it to HBO to give me a long-overdue Social Studies lesson on our second president. 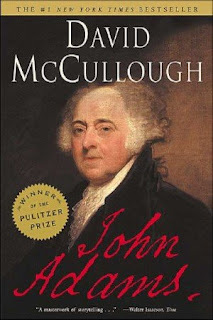 The seven-part miniseries John Adams -- based on David McCullough's biography -- spans this oft-overlooked Founding Father's political journey, giving us an idea of just what gumption it took to establish a nation. That said, while we can admire these decisions in hindsight, it's sometimes difficult (at least for me anyway) to put them in any modern context. Our modern revolutions seem sanitized. Our American personality is well-defined. Instead of flowery oratory, our politicians tend toward bloviation. And it's hard to imagine John and Abigail tweeting 140 love characters to each other. * "Brave the storm in a skiff made of paper." As the Continental Congress debated the prudence of war with Britain, John Dickinson of PA followed his beliefs and staunchly opposed the war, even though he was quite the odd man out. Though his frightening vision of post-war ruination didn't come true (thank God), he was still a needed ballast, a necessary reality check, for the fiery patriots among the group. For in trying to convert him, the hawks better articulated their position and clarified their goals. Lesson: Devil's advocates can justify/reinforce/temper/refine visionaries' visions. * No one can stage a revolution alone. John Adams brought his gift of reason and oratory. Sam Adams brought initial passion and inspiration. Washington brought natural leadership. Franklin brought good humor and diplomacy. Jefferson brought writing skill. Abigail brought common sense and stability. All told, they balanced one another out and were able to reach unity with a cohesive plan. The best example of this: when Adams asks Jefferson to draft the Declaration of Independence, because he knows he will do the best job. Lesson: Bring strong partners on the journey. * Sometimes, there's just no time to plan every detail. The naysayers had every right to be concerned -- the colonies had no army, navy, weapon stockpiles, etc. But inaction brought the fledgling country to a point where they had to act or die. They resigned themselves to making it up as they went along. But what did they know? They knew they had to be allies in the fight. They knew they had to declare absolute independence -- which made backing it up imperative. Lesson: Have the end goal in mind, but don't let the perfect become the enemy of the good. Now, I still have a couple episodes left in the series, so let's see what other lessons emerge. For those of you who have seen the series or read the book -- what did you take away? A GREAT WRITER, AGREAT BOOK. YOU NEED TO BE CAREFUL ABOUT WATCHING THIS KIND OF STUFF, YOU MIGHT WIND UP CHANGING PARTIES. OF COURSE, YOU MIGHT ALREADY BE AN INDEPENDAnT. As you know, Julia, Dad and I have watched this series as well. Through the entire show I couldn't help but think about the hardship of daily life for these people. You have examined them from the perspective of the larger goal---I could not stop thinking about how difficult it was just to be healthy or keep your children alive. The fact that they could even desire or work for a free, democratic society amazes me. I was also impressed by their intelligence and wit. At a time when education was indeed a privilege and a rarity, so many of them made the most of what they were given. It's a wonderful show and I hope it makes its way into schools. What a great way to learn about our country's birth. Maybe I'll watch it again over the July Fourth holiday. A fitting tribute, don't you think? Wish I can go back in time with a camera .. what a great photo blog *THAT* would be! A wonderful review and post Julia! I did not read this bio of Adams, but I concur with your assessment of him being an overlooked President... he did much in establishing the tone of government during his time in office. There is an irrevocable power that stems from never giving up. Not like Churchill who could horn-call any public gathering to declare no for no' sake: "Never give, never give up, never give up!" Rather, inexōrābilis is persistence – more than mere survivability. That is makes Adams so great. He was a critical, albeit second-hand, apostle to the new nation and therefore left to history to uphold the gains of all others: Washington's leadership, Jefferson's literary Rights of Man, the South's deep economic concerns, Abigail's angst for the family at home, and her own true love for Jon. Yet his loyalty to all he thought important didn't change, and while it made for cold beds with Abigail at times, it also prolonged them and provided the surrogate birth to what the boisterous men in Independence Hall could never have fathered. You see, Adams realized his role in life was to shepherd this document, this cause into true existence; past the myopic victory marches and straight through the bloody, Orwellian disagreements between Jefferson and Hamilton...and into the boring, forever unknown to apply forward. Inexōrābilis. Now, I make no claim to fame except I recently watched the whole series and mean soon to read 1776. This is what a mid-aged journalistic grasping for stability in a changing profession does these days, I'm learning. But I still hear inexōrābilis call to me in the din of the newsroom, and see it wave to me from the back of my next music rehearsal room or even Ultimate field. I'm starting to pray that that it really is me it's beckoning and that it knows what it's doing. Otherwise, time to pray somemore. Tazewell Garden Project, part 3: It's Alive! Funny Baby Pictures: Take that, toy!